This is true. This is a table I actually threw together in 5 minutes, without purchasing a thing. Okay, yes, I do collect an awful lot of tabletop items so I have much on hand. And yet in this case, I had set a formal table in the dining room for a large gathering and didn’t give much thought to the fact that several extra people would be sitting in the kitchen. Hence it was exactly the way I put a table together in my kitchen, when I’d like to elevate a weeknight dinner to a special level… or at least a level above standing at the counter eating out of a tin! The first thing I did was grab the basics – classic white dinner plates and matching salad plates. I also pulled my normal silverware, as my set is large enough to accommodate the extra guests. Now that the guests had the essentials to enjoy the meal, the next step was to incorporate a special feel to this ordinary setting. The little white teapot with the fall theme was an easy add, as it worked well with the basic white I began with. Now it was time to come up with a quick visual direction and fill in some color. I didn’t have to look far for inspiration. 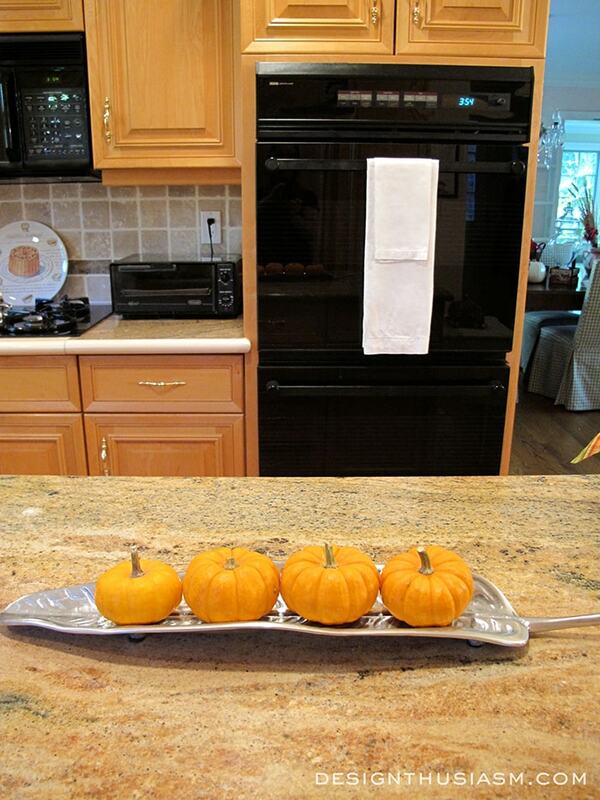 Sitting right on my kitchen counter was a long leaf platter with mini pumpkins lined up. This being fall, a color feeling was all but pre-determined. 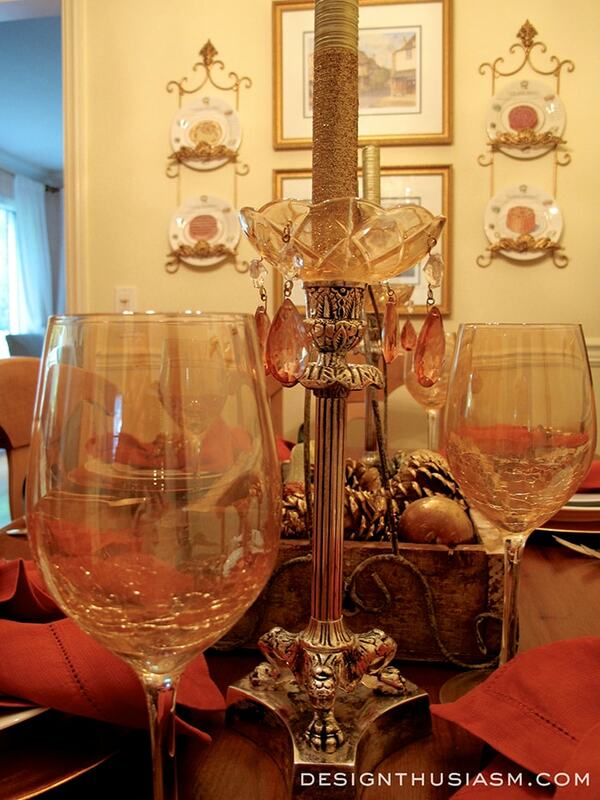 So, out came the golden wine glasses with the crackle bottoms from Pier 1. The glimmer really dresses the table up a bit. 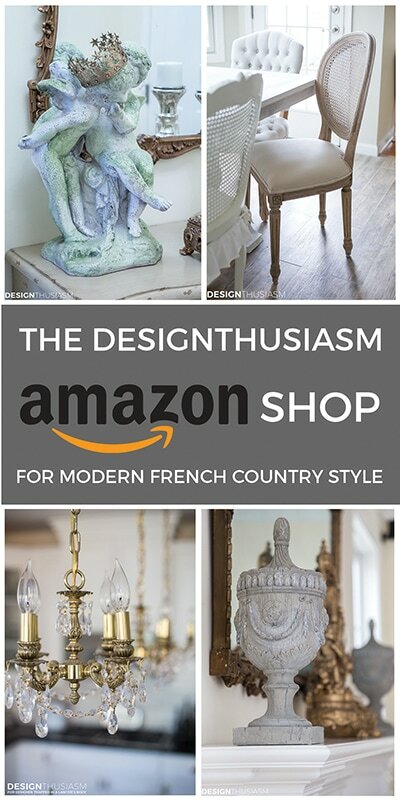 I then began a search for anything I already owned that would complement the warm tones of the season, keeping in mind that my best pieces were already in use on the dining room table. It’s rare when I don’t use fresh flowers for my table settings, but this was a quick improvise, so my go to centerpiece was the tray of gourds and pine cones I’ve been keeping there during the day. Not exactly a fragrant bouquet, but lightyears better than stacks of paper and mail. 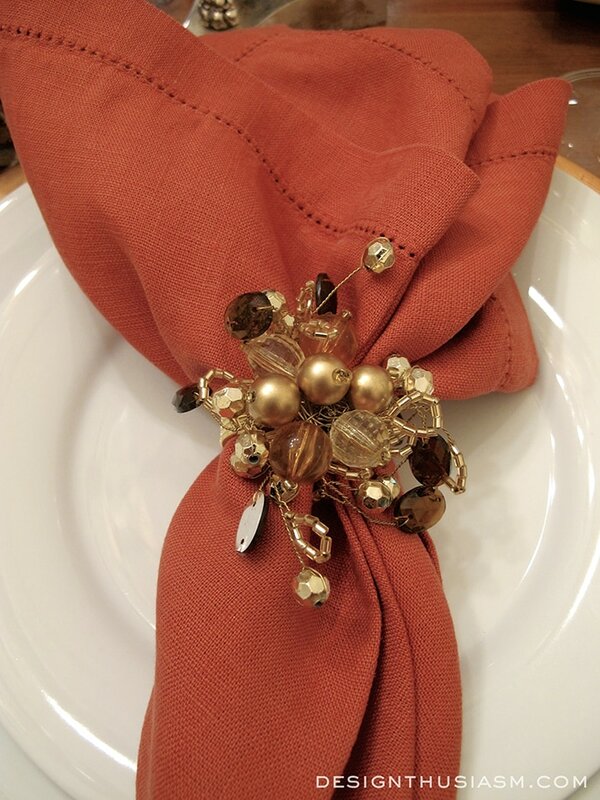 To bring out the warm tones in the gourds and really drive the fall theme home, I pulled my russet linen napkins out and gathered them in my amber jeweled napkin rings. 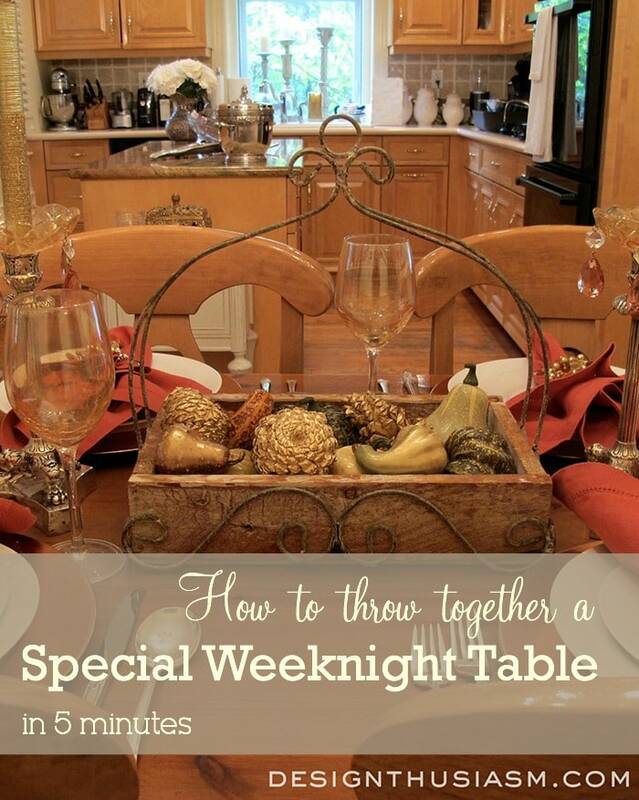 This is probably the number one thing you can do to a basic weeknight place setting to take it out of the ordinary. With a base of neutral plates, you can pull any color napkins you have on hand and really add an elegant touch to a table, even though it is set in the kitchen. Another upgrade to any table is the addition of aroma. I often use candles but here I brought in my autumn potpourri and slipped it into a little vintage silver holder that’s always on my kitchen island. A pretty bow, which actually came on the potpourri bag, is a 3 second touch of luxury. To add a very quick hint of elegance, I tucked my bronze chargers beneath the snowy white plates. The more glimmer I could incorporate into this very wood kitchen, the less bland it would look, and it picked up the similar tones in the glasses and napkin rings. The final touch was, without a doubt, my candlesticks and bobeches. 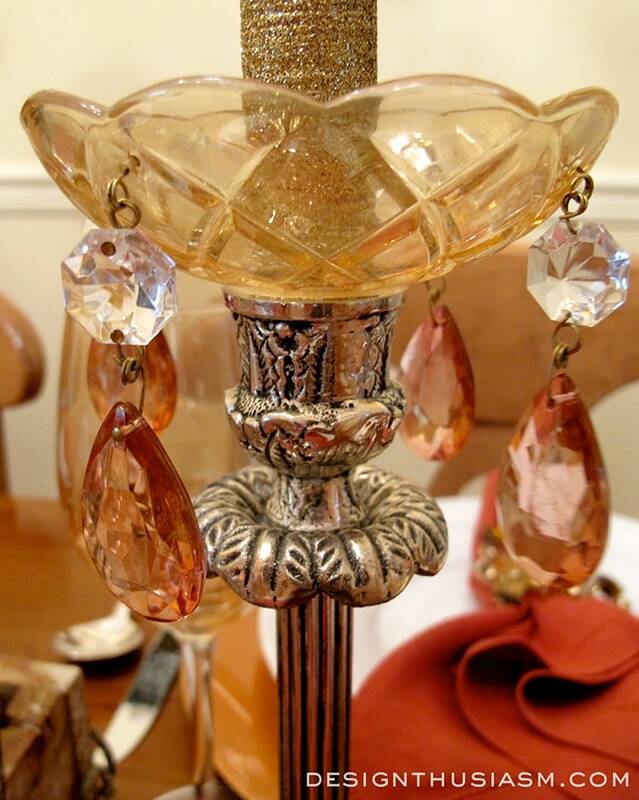 For some this might be a bit fussy for the kitchen, but I am enamored with candles and crystal bobeches in particular, so I selected my golden ones with the rose colored drops and added glittered gold candles. 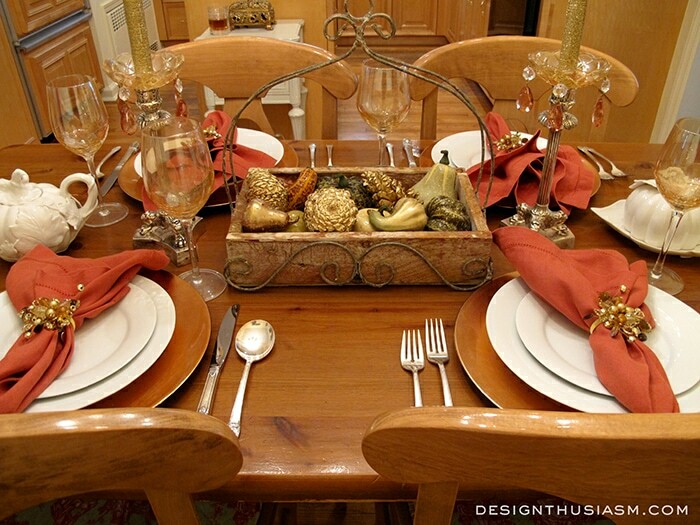 After the cloth napkins I would say this is most significant update to a weeknight table that makes it special. 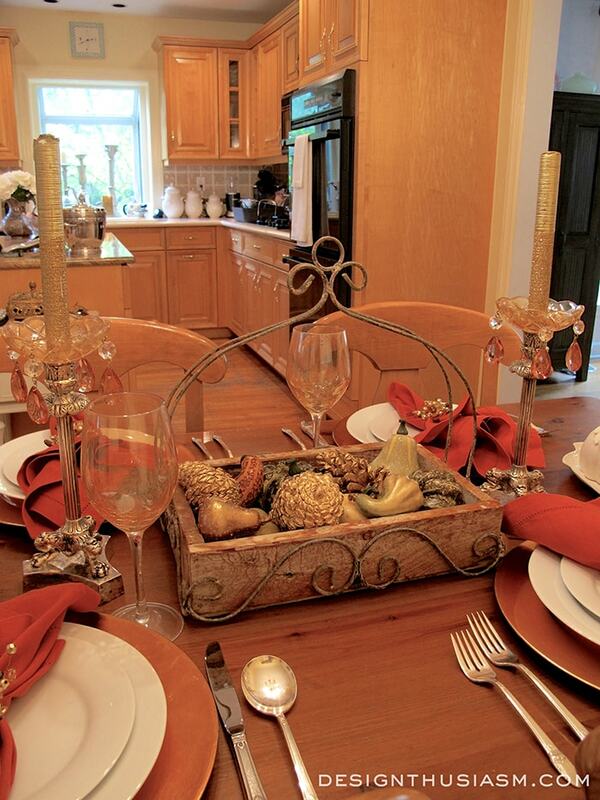 Of course it’s always important when eating in the kitchen to keep the counters clear and the room uncluttered. It’s never going to feel like a well dressed dining room, but when you threw it together in 5 minutes, what’s to complain about? Linking with Metamorphosis Monday, YourDesignsThisTime, The Scoop, Inspire Me Tuesday, Twirl and Take a Bow, Wow Us Wednesdays, Knick of Time, Tablescape Thursday, From My Front Porch to Yours, Home and Garden Thursday, Feathered Nest Friday, Show and Tell Friday, Silver Pennies Sundays. Those candlesticks are gorgeous! 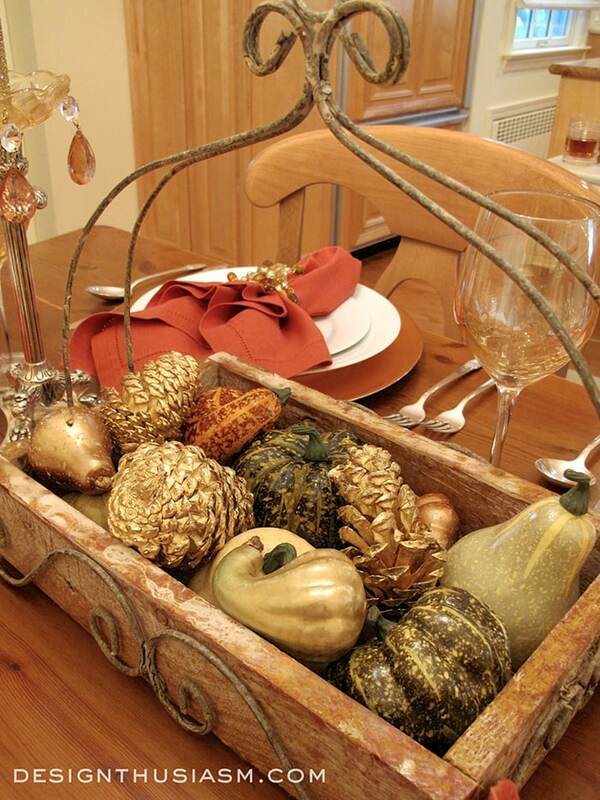 And I really like the basket with gourds and pine cones. I would love to own something like that!! Are they antiques? 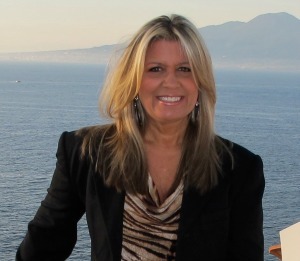 I am enjoying your blog! Thanks Diane!! No they’re not antiques. Funny thing is most of my candlesticks are, but these are not. Can’t remember where I got them, but just some small local store I’m sure. And the basket is from Home Goods… 🙂 Thanks for visiting!! Beautiful, Lory! Love the basket with the pinecones! Your tables are always so pretty, you put a lot of thought into the detail and it shows. 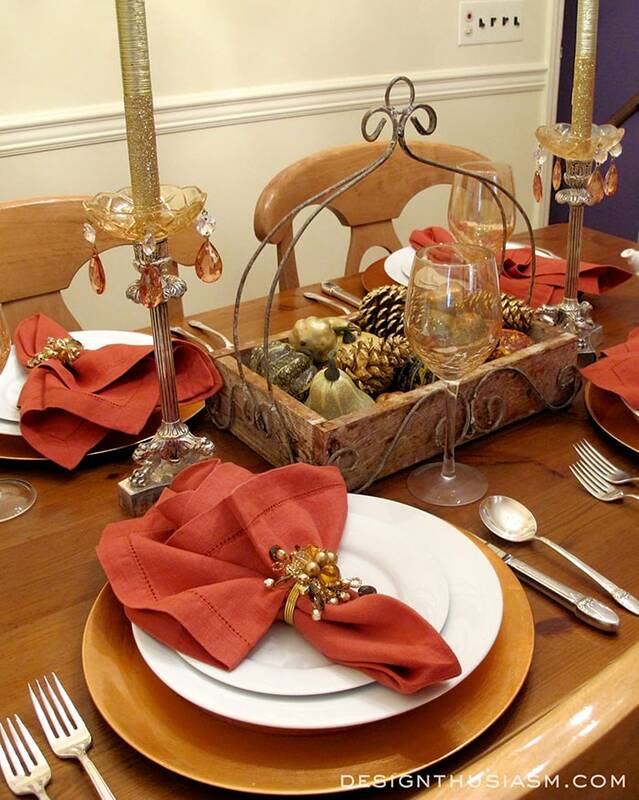 I am sure everyone loves to come to dinner at your home and is eager to see what theme you have set your table in. Beautiful table Lory, love your centerpiece! Smart you to use what you have. So often we just don’t take the time to bring out of the closet those things that make any table special. I, too, do a table every night, perhaps not as glamorous as the beauty you’ve created. Thanks Linda! I do feel very strongly about using my things. But I really did just throw this one together in 5 minutes! Lol… 🙂 The only thing I don’t really use every night is linen napkins. Beautifully done! I would have been honored and delighted to dine at this lovely table!! I totally agree with the neutral plate thing!!! Having those as the base of the setting gives you carte blanche to add color and pattern and texture to your heart’s desire! 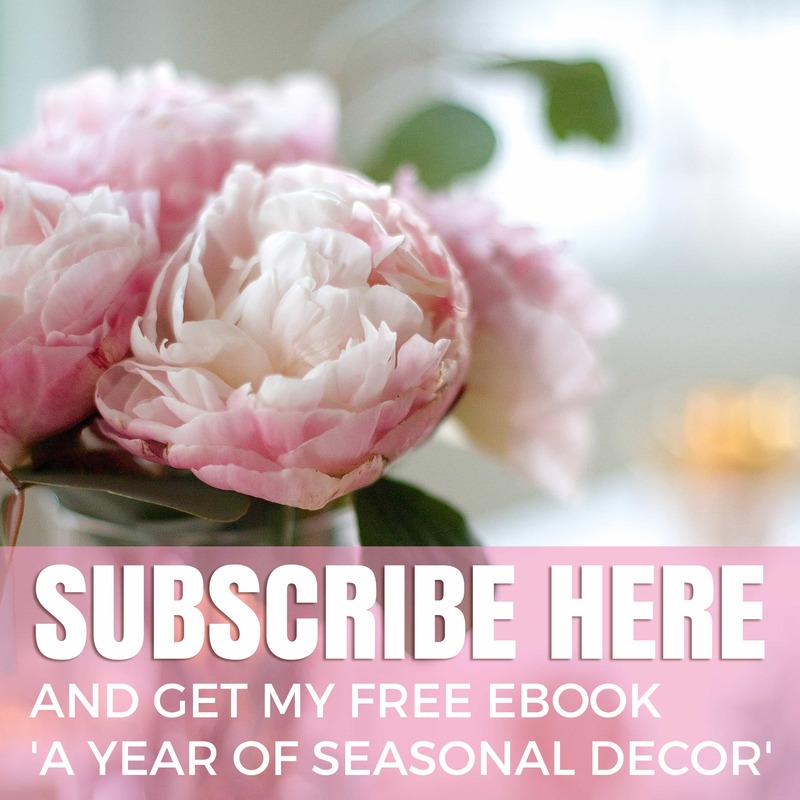 Having a lot of decorative accoutrement within arm’s reach is always helpful, but for those who don’t have that advantage, I think your post has opened the door to some ideas on how they might adjust. 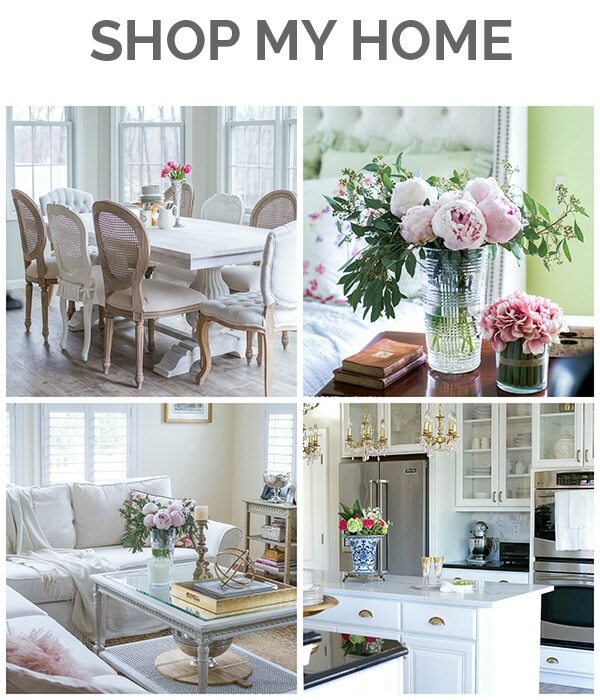 I love this gorgeous table and how you pulled it together so quickly yet beautifully. Wonderful color scheme! Autumnal colors are my favorite. Thanks so much Bev! I love fall colors too. They go so perfectly with the foods and smells of the season… 🙂 Thanks for visiting! Gorgeous. I love the updated tool box and the wine caddy repurposed is such a fabulous idea. Thanks tons for linking to Inspire Me. 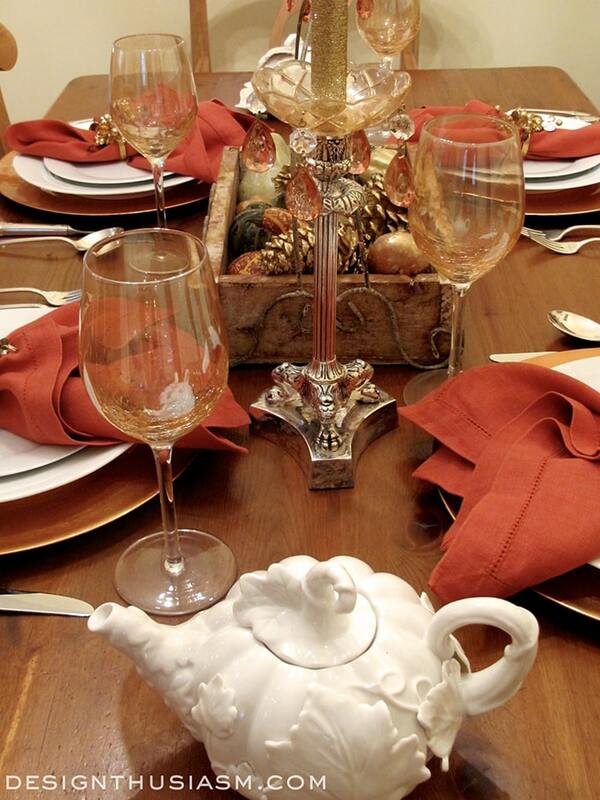 So nice to see such a pretty fall table! I am glad to see you using pine cones. I like to use them in the fall too. Love that teapot! Thanks, Barbara! I love to include some natural elements whenever possible… 🙂 Fall always lends so many options. Thanks for visiting!! 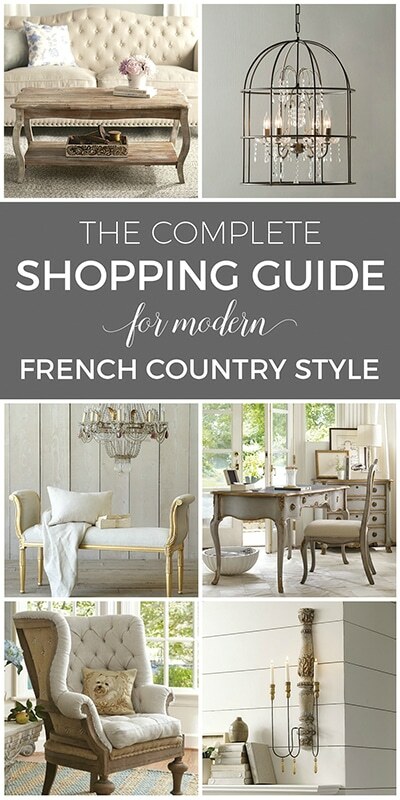 This is an excellent example of easy elegance. I love the white pumpkin teapot. 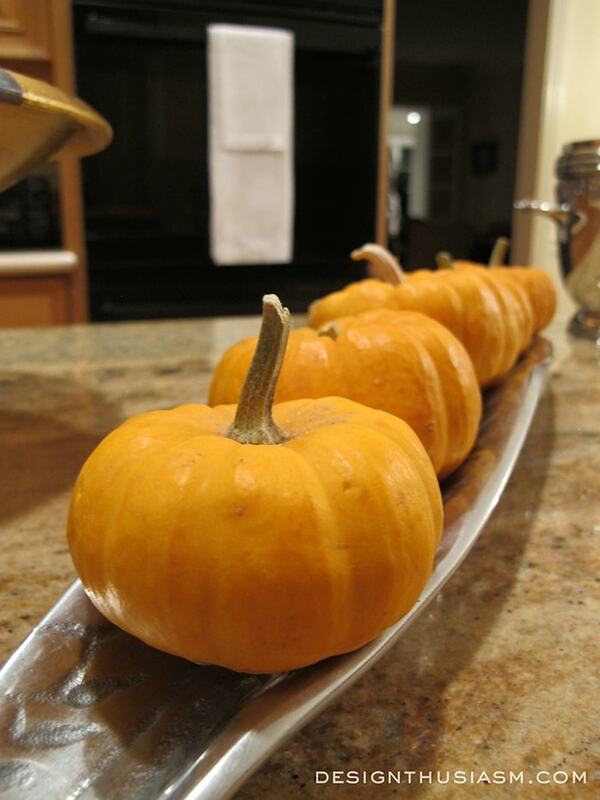 Your box of fall accessories is a wonderful centerpiece. Please take a peek at my tablescape this week! Beautiful! Looks like you slaved for hours, lol. Having so many lovely things to choose from obviously helps, but it still takes that certain flare to get it all right. 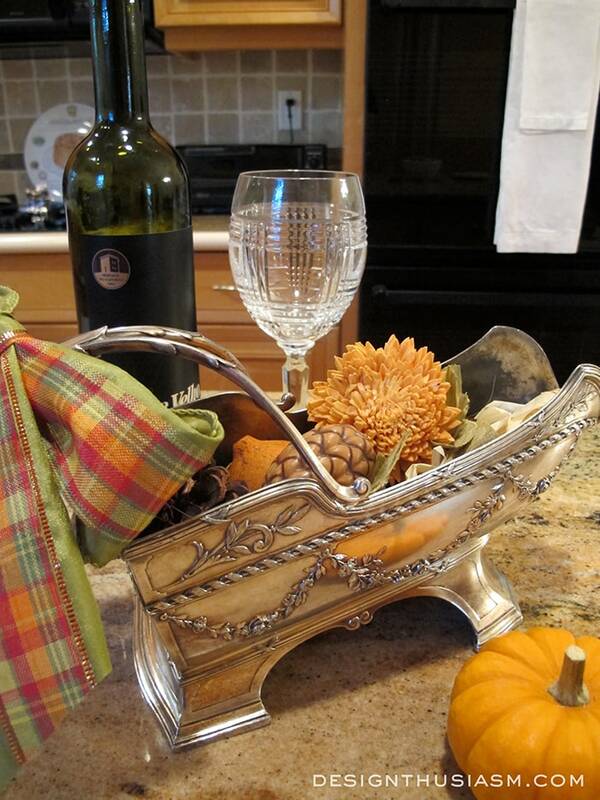 Love that ornate silver wine holder. Thanks. Thank you so much! Such a nice comment… 🙂 I do like to ensure I have enough things to choose from because it certainly makes it easier to pull a table together. Glad you appreciated!